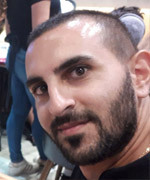 July 26, 2018 - Yotam Ovadia, 31, a father of two, was stabbed to death by a terrorist who infiltrated his West Bank settlement. 31-year-old Yotam Ovadia, a father of two and resident of the West Bank settlement Adam near Jerusalem, was stabbed to death today (Thursday, 26 July 2018) by a terrorist who infiltrated his settlement through the fence. The terrorist, Mohammad Tareq Yousef, 17, from Kobar, managed to stab two other passersby before he was shot and killed. Ovadia arrived at the Hadassah Medical Center at Jerusalem’s Mount Scopus in critical condition where he was treated for hours before medical personnel were forced to declare his death. Ovadia is survived by his wife and two sons aged two and seven months. His funeral, which took place on Friday (July 27, 2018), was attended by hundreds, including Members of Knesset, Jerusalem Mayor Nir Barkat and senior military officials.